Everything you ever wanted to know about Roger Tory Peterson; and more, about sums up this newly released book about his life. All through my reading of this book, I kept wondering how I was ever going to condense four hundred pages of the life of this man into a few short paragraphs. It is nothing short of amazing, how many men, women and children this man influenced, how many books he wrote, how many places he visited and how many birds he saw. Not to mention his other accomplishments. Yet, one thing you come away from this book with is a sense of awe as to the depth of RTP, as he was often called. 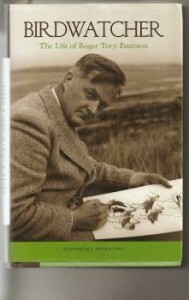 Not only was he a self taught birder, but he was a naturalist. He knew plants, wildflowers, butterflies, moths and everything else that fit into our natural environment and why this environment needs to be protected. In 1980, RTP received the Presidential Medal of Freedom. I think President Jimmy Carter summed up RTP’s life best of all. “Roger Tory Peterson has achieved distinction as a consummate painter, writer, teacher and scientist. As an unabashed lover of birds and a distinguished ornithologist, he has furthered the study, appreciation and protection of birds the world over. And he has done more. He has impassioned thousands of Americans, and has awakened in millions across this land, a fondness for natures’ other two-legged creatures”. Roger Tory Peterson was a guest speaker at a Caloosa Bird Club meeting. I can only imagine the excitement that event brought to the club. The members who met him were very fortunate indeed.